PES 2018 is a sports video game developed by PES Productions and published by Konami for Microsoft Windows, PlayStation 3, PlayStation 4, Xbox 360 and Xbox One. The game is the 17th installment in the Pro Evolution Soccer series and was released worldwide in September 2017. 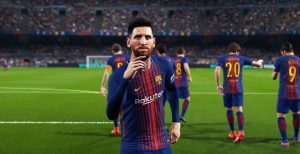 Pro Evolution Soccer has been the best footy game on consoles for years now, but does the latest sequel add anything new? PES 2018 is undoubtedly an improvement over its predecessor. This year’s effort builds on the superb foundation of the previous game, consolidating its gains and focusing on further satisfying its core audience. Real Touch+ is an elaboration of PES 2017’s Real Touch feature, which improved a player’s first touch and provided them better awareness in positioning themselves to shield the balls from opponents and bringing it under control. Players use thighs, shoulders, stomach, chest and the entire foot – front, side and back – to control the ball, and the result is imperfect passes have a better chance of finding their target, as players have more ways to interact with passes coming towards them. This diversity of interaction adds a palpable sense of visual drama to matches and goes a long way to making things look closer to what you’d expect to see on TV. Goalkeepers improved a lot last year, but their effectiveness has taken a step backward this season.Their dives are often spectacular and when they make a great save it’s impossible to not be impressed. Too often though, they make poor decisions and fumble weak shots. Players also shield the ball and stumble past opponents more realistically, not only helping you hold on to the ball but also making them feel more like players, not just dots on a screen. Timid strikes from long range are fumbled too frequently, especially when the keeper has a clean line of sight and plenty of time to position himself. They also have a tendency to spill seemingly simple saves back out towards the penalty spot, leaving for an easy tap in. Random Selection Match is arguably the star of the new game modes over last year. It gives you the option of playing with a team made of up of randomly assigned players, based on set parameters determined before the match. You can set up to three categories from which your team will be chosen: teams, leagues and nationality. The new addition of Online Co-op is also worth spending serious time mastering, with teams of three players facing off against one another. 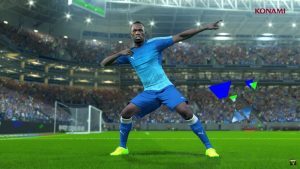 It’s here that the tactical side of PES 2018 shines, with quality sets of partners able to simultaneously park the bus with their defence and overload in attack. The AI on offer by default is intelligent enough to keep you entertained, but it’s no replacement for practised, experienced human players and online co-op is apt demonstration of that. MyClub straddles both online and offline arenas. The idea – much like FIFA Ultimate Team – is to acquire new players and build the squad of your dreams. Master League remains the showpiece offline mode, with a new option to increase the difficulty of managing your club’s off-the-field dealings revealing itself a welcome addition. Choose the ‘Challenge’ difficulty setting when starting a new game and fresh faces become hard to sign, your current squad is more likely to want to leave if things go wrong and, ultimately, keeping your job is less straightforward. Challenge mode is hardly akin to a Football Manager experience, but it does force you to think about the makeup of your squad over the longer term and that influences your overall approach accordingly. True, it’s a game that benefits from serious time being dedicated to it, in order to learn all of its possibilities. As such, it’s not easy to recommend PES 2018 to the casual football game fan. But for those serious about diving in and soaking up all there is to know about Konami’s beautiful game, you will not find yourself disappointed. Previous Article Nintendo Company inc.